Give it a 3 star cause it's more comic book than novel with a older hero (60 something) acting like a young Clark Kent/Superman(20 something)). The book opens with the hero jumping off a cliff (after whacking a high profile target) into very cold water and swimming to safety. He's now on the run from a evil military General who has "abused" him since he was a young soldier (war hero with no medals)in Vietnam. Oliver ends up in Divine a small coal mining town with a drug "problem" where we get another evil character who loves to torture people in his hell hole crib. The ending's beyond belief for an adult, but kids may buy it. The End of the Camel Club??? "Divine Justice" reunites Oliver Stone and the Camel Club in a good book by David Baldacci. I've enjoyed all the Camel Club books and while the writing wasn't as good as it could have been, (I think that the more successful an author becomes more successful the quality of his writing suffers) it's still worth reading. Oliver Stone flees after killing the two people he blames for killing his wife, stealing his daughter and then killing her, but he doesn't get far. As the book unfolds, we finally find out why Oliver Stone (aka John Carr) is the man he is and what has fueled his desire for "Divine Justice." After coming to the aid of a young man being beaten by three others he is forced to leave the train they are on with the young man. They wind up in the boy's hometown, Divine that harbors a super-max prison atop a mountain, which can only be reached by helicopter. All is not well in Divine and since trouble always finds Oliver, he is soon enmeshed in the thick of it. While trying to get to the bottom of the town's secrets he realizes that for the first time since his wife's death he's falling in love with Abby, the mother of the young man he rescued but they may all die if he cannot find the truth. Realizing that their leader and friend is in trouble the members of the Camel Club search for him to give them whatever assistance they can. The novel graphically describes the backbreaking, grueling, and deadly lives of coal miners who work underground so that we can have electricity. In one chapter Abby says that anyone who has a loved one working in the mines don't use electricity for cooking or heat because they know the "true" cost of electricity. I'll admit after reading this I've become more conservative with my energy consumption. This could be the end of the Camel Club series, so if you've enjoyed the previous books you need to read this one. David Baldacci once again does not disappoint with his book Divine Justice. An excellent continuation of the Camel Club series picks up right where the last book, Stone Cold, left off. The constant action and enjoyment of his books make them great reads every time. Though many of his books can be read as a stand alone I suggest you refresh yourself with Stone Cold before reading Divine Justice. This book would be tough to follow if you did not know the development of Oliver Stone and his Came Club buddies. The entire series is great but you might be confused during much of this book if you don't have the background Baldacci's previous books provide. It is a very good idea if one has read the previous Camel Club books before reading Divine. This one is a big departure from the previous ones with Oliver doing a solo and not really a part of the original ensemble. This is all pretty much Oliver on his own and on the run in a solo role. I do think Oliver does better with an ensemble but I read the whole thing and it was fairly good overall. The last 30% of the story was just not as good as the beginning at all and it loped along a predictable line with Oliver beset by the evil guys who are nearly like cartoon characters. Having the President getting involved at the end was rather a large cliche too. It was the easy way out...call in the Prez. David Baldacci draws us in to the promise of a fascinating and fast-paced storyline following the Camel Club members from the very first sentence. Revenge, justice, and loyalty are all at stake as John Carr and friends attempt to right wrongs on a national level while also uncovering a small town's secrets and bring its citizens back from a state of lawlessness and cover-ups so they can live again without fear. This hard to put down story has you cheering for the good guys even when they have to commit crimes to save themselves and others. Divine Justice is a satisfying and enjoyable read. Having read all the Camel Club books up to this point i was very much looking forward to reading this next chapter in the adventure of Oliver Stone and his team. I must say that i was not Disappointed in this book whatsoever. As a matter of fact i may have enjoyed this one more than several of the other books in this series. This story takes a different turn than several of the other books and quickly gets out of the washington DC political spotlight that several of the other books have stuck with. For me this was a nice change. I enjoyed the twists and turns and in many cases i was left trying to guess what was going to happen next. I love books that keep me guessing. True to his previous books, this was GREAT!! This is the very first book I've read from David Baldacci. I realize, after reading DIVINE JUSTICE, that I have missed out over the years! DIVINE JUSTICE is not just any CIA novel. It takes twists and turns, from a turn to rural Virginia to a prison that would have been scary even during Medieval times to illicit drug trafficking. Oliver Stone, the man from the "Camel Club," is the most wanted man in America, accused of killing a senator and a big wig in the intelligence community. 4th and best in the series! Divine Justice tied all the loose ends of The Camel Club - a fun series to read. Baldacci is a master weaver of story telling, and this last sequel to The Camel Club series kept me turning pages knowing that I was hooked to the very end. 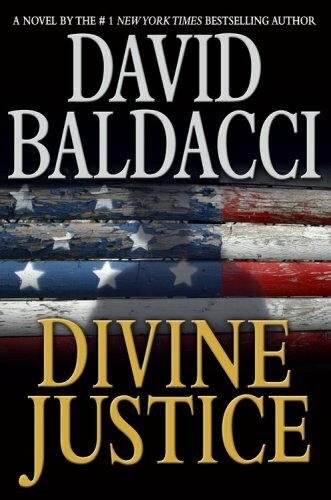 I must say that Divine Justice is, by far, the best one of the series, but I do hope that Baldacci gets on with other stories and puts this series to rest.